Measurements: 8-3/4 in. Face, 6-15/16 in. Height, 4-7/8 in. Projection, 96 in. / 8 ft. Length Finish: Olympic Gold, Silver, Wood Graining Suggested Ceiling Height: 8 - 12 ft. 4 pieces minimum per order. 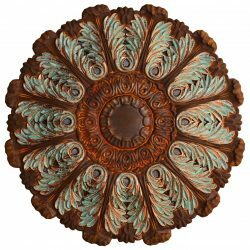 NOTE: As our hand painted Crown Moldings are NON-RETURNABLE, we highly recommend you to buy a sample of this product before placing your order. Measurements: 8-3/4 in. Face, 6-15/16 in. Height, 4-7/8 in. Projection, 96 in. 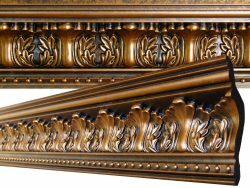 Length Finish: Olympic Gold Suggested Ceiling Height: 8 - 12 ft. 4 pieces minimum per order. NOTE: As our hand painted Crown Moldings are NON-RETURNABLE, we highly recommend you to buy a sample of this product before placing your order. Measurements: 5-3/8 in. Face, 3-7/8 in. Height, 3-5/8 in. Projection, 94-1/2 in. 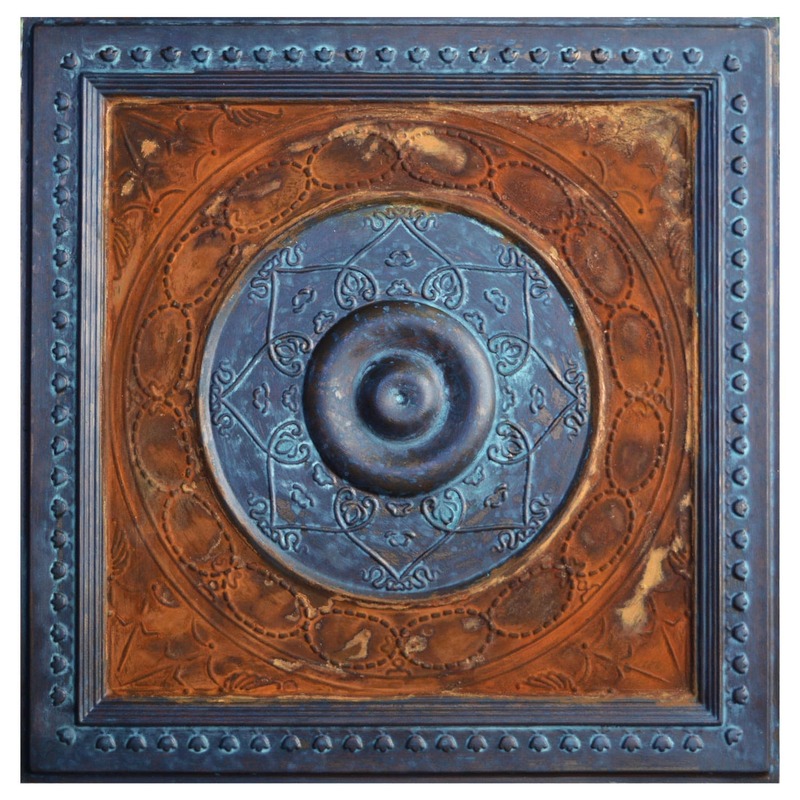 Length Finish: Antique Bronze, Antique Copper, Sapphire Suggested Ceiling Height: 7 - 10 ft. 4 pieces minimum per order. 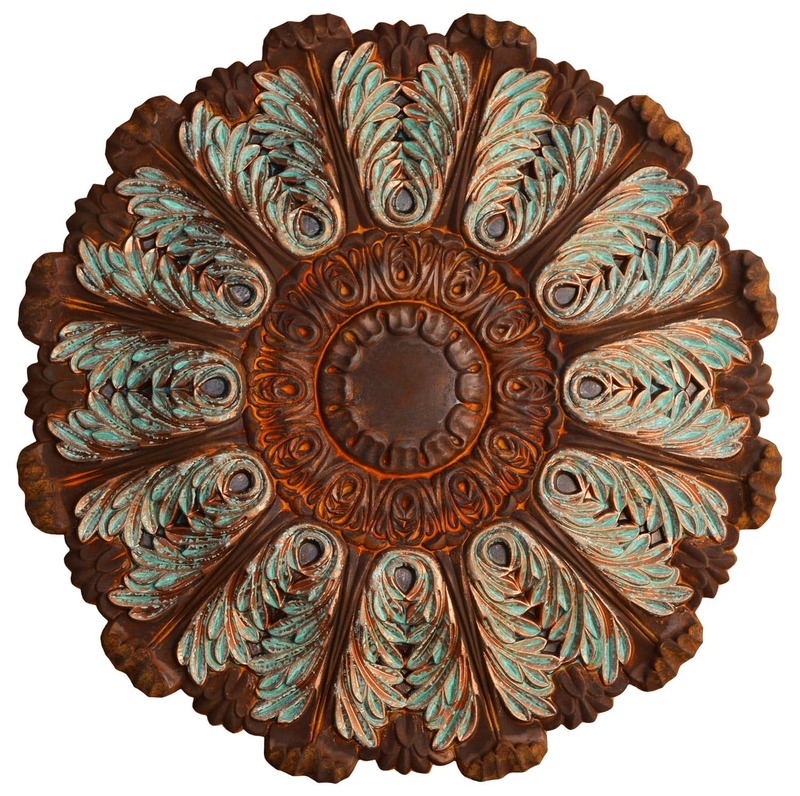 NOTE: As our hand painted Crown Moldings are NON-RETURNABLE, we highly recommend you to buy a sample of this product before placing your order. Measurements: 5-3/8 in. Face, 3-7/8 in. Height, 3-5/8 in. Projection, 94-1/2 in. 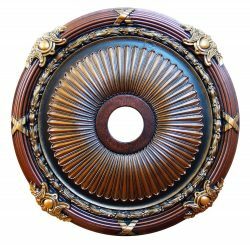 Length Finish: Antique Bronze, Antique Copper, Wood Graining Suggested Ceiling Height: 7 - 10 ft. 4 pieces minimum per order. 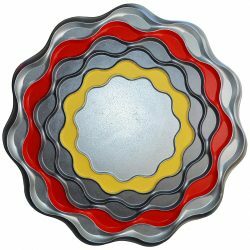 NOTE: As our hand painted Crown Moldings are NON-RETURNABLE, we highly recommend you to buy a sample of this product before placing your order. Measurements: 7-1/2 in. Face, 5-1/4 in. Height, 5-1/4 in. Projection, 94-1/2 in. 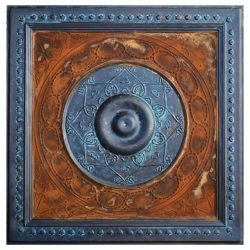 Length Finish: Antique Bronze, Antique Copper, Wood Graining Suggested Ceiling Height: 8 - 12 ft. 4 pieces minimum per order. 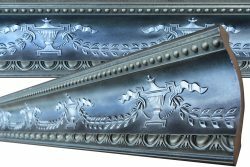 NOTE: As our hand painted Crown Moldings are NON-RETURNABLE, we highly recommend you to buy a sample of this product before placing your order. Measurements: 7-1/2 in. Face, 5-1/4 in. Height, 5-1/4 in. Projection, 94-1/2 in. 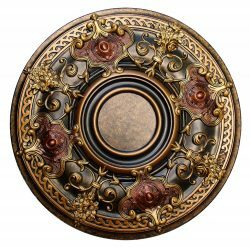 Length Finish: Antique Bronze, Antique Copper, Olympic Gold Suggested Ceiling Height: 8 – 12 ft. 4 pieces minimum per order. NOTE: As our hand painted Crown Moldings are NON-RETURNABLE, we highly recommend you to buy a sample of this product before placing your order. Measurements: 7-1/2 in. Face, 5-1/4 in. Height, 5-1/4 in. Projection, 94-1/2 in. Length Finish: Ivy, Warm Silver Suggested Ceiling Height: 8 – 12 ft. 4 pieces minimum per order. 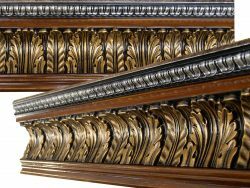 NOTE: As our hand painted Crown Moldings are NON-RETURNABLE, we highly recommend you to buy a sample of this product before placing your order. Measurements: 6-1/2 in. Face, 5 in. Height, 4-15/16 in. Projection, 96 in. / 8 ft. Length Finish: Olympic Gold Suggested Ceiling Height: 7 - 10 ft. 4 pieces minimum per order. 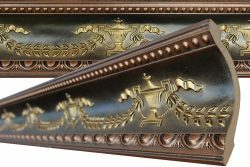 NOTE: As our hand painted Crown Moldings are NON-RETURNABLE, we highly recommend you to buy a sample of this product before placing your order. Pre-cut corners are available for this crown molding, order here. Measurements: 6-1/2 in. Face, 5 in. Height, 4-15/16 in. Projection, 96 in. / 8 ft. 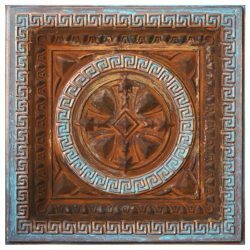 Length Finish: Antique Bronze Suggested Ceiling Height: 7 - 10 ft. 4 pieces minimum per order. 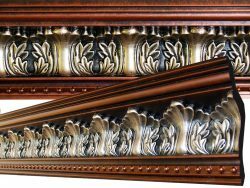 NOTE: As our hand painted Crown Moldings are NON-RETURNABLE, we highly recommend you to buy a sample of this product before placing your order. Pre-cut corners are available for this crown molding, order here. Measurements: 6-1/2 in. Face, 5 in. Height, 4-15/16 in. Projection, 96 in. / 8 ft. Length Finish: Antique Copper, Warm Silver Suggested Ceiling Height: 7 - 10 ft. 4 pieces minimum per order. 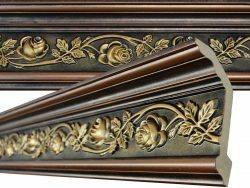 NOTE: As our hand painted Crown Moldings are NON-RETURNABLE, we highly recommend you to buy a sample of this product before placing your order. Pre-cut corners are available for this crown molding, order here. Measurements: 14 in. Face, 10 in. Height, 9-1/2 in. Projection, 96 in. Length Finish: Light Brown Faux Finish Suggested Ceiling Height: 14 + ft. 4 pieces minimum per order. Measurements: 6-11/16 in. Face, 5-1/2 in. Height, 3-5/8 in. Projection, 94-5/16 in. 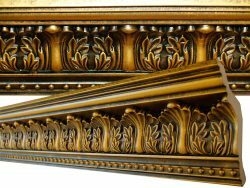 Length Finish: Antique Bronze, Olympic Gold Suggested Ceiling Height: 7 - 10 ft. 4 pieces minimum per order. 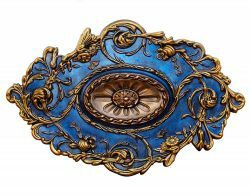 NOTE: As our hand painted Crown Moldings are NON-RETURNABLE, we highly recommend you to buy a sample of this product before placing your order. Measurements: 6-11/16 in. Face, 5-1/2 in. Height, 3-5/8 in. Projection, 94-5/16 in. 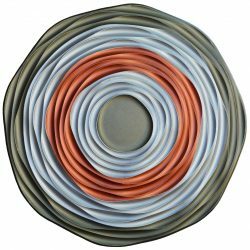 Length Finish: Copper Penny, Silver Suggested Ceiling Height: 7 - 10 ft. 4 pieces minimum per order. 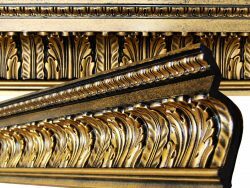 NOTE: As our hand painted Crown Moldings are NON-RETURNABLE, we highly recommend you to buy a sample of this product before placing your order. Measurements: 12-1/2 in. Face, 9 in. Height, 9 in. Projection, 94-1/2 in. 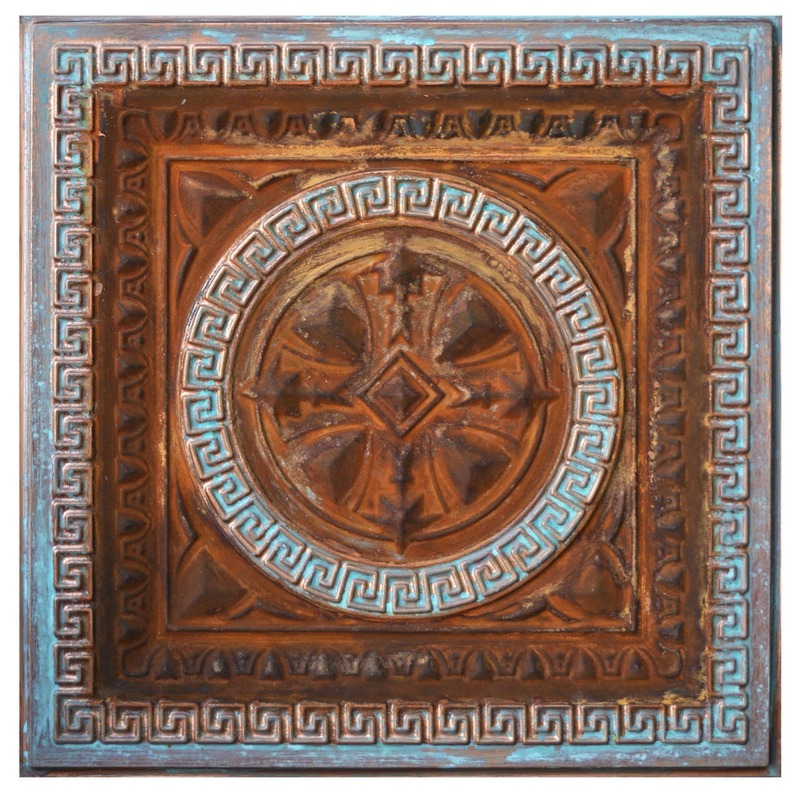 Length Finish: Antique Bronze, Antique Copper, Olympic Gold Suggested Ceiling Height: 14 + ft. 4 pieces minimum per order. Measurements: 6-3/4 in. Face, 5-1/8 in. Height, 4-1/4 in. Projection, 94-1/2 in. 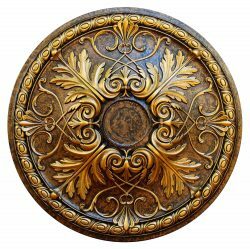 Length Finish: Antique Bronze, Olympic Gold Suggested Ceiling Height: 7 - 10 ft. 4 pieces minimum per order. NOTE: As our hand painted Crown Moldings are NON-RETURNABLE, we highly recommend you to buy a sample of this product before placing your order. Measurements: 6-3/4 in. Face, 5-1/8 in. Height, 4-1/4 in. Projection, 94-1/2 in. 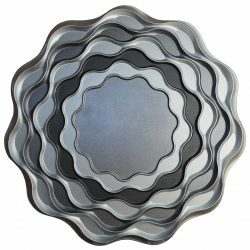 Length Finish: Ivy, Silver Suggested Ceiling Height: 7 - 10 ft. 4 pieces minimum per order. 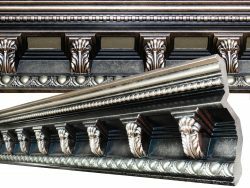 NOTE: As our hand painted Crown Moldings are NON-RETURNABLE, we highly recommend you to buy a sample of this product before placing your order. Measurements: 9-1/4 in. Face, 6-1/2 in. Height, 6-1/2 in. Projection, 94-1/2 in. Length Finish: Antique Bronze, Antique Copper, Olympic Gold Suggested Ceiling Height: 12 - 14 ft. 4 pieces minimum per order. 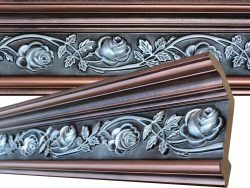 NOTE: As our hand painted Crown Moldings are NON-RETURNABLE, we highly recommend you to buy a sample of this product before placing your order. Measurements: 9-1/4 in. Face, 6-1/2 in. Height, 6-1/2 in. Projection, 94-1/2 in. Length Finish: Antique Bronze, Blackened Bronze, Tequila Gold Suggested Ceiling Height: 12 - 14 ft. 4 pieces minimum per order. 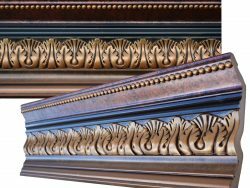 NOTE: As our hand painted Crown Moldings are NON-RETURNABLE, we highly recommend you to buy a sample of this product before placing your order. Pre-cut corners are available for this crown molding, order here. Measurements: 8-5/8 in. Face, 5-3/8 in. Height, 6-3/4 in. Projection, 94-1/2 in. Length Finish: Antique Bronze, Antique Copper, Tequila Gold Suggested Ceiling Height: 8 - 14 ft. 4 pieces minimum per order. NOTE: As our hand painted Crown Moldings are NON-RETURNABLE, we highly recommend you to buy a sample of this product before placing your order. Pre-cut corners are available for this crown molding, order here. Measurements: 6 in. Face, 4-1/4 in. Height, 4-1/8 in. Projection, 96 in. Length Finish: Blackened Bronze, Warm Silver Suggested Ceiling Height: 7 - 10 ft. 4 pieces minimum per order. 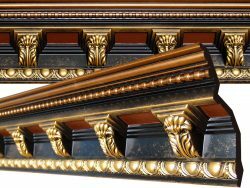 NOTE: As our hand painted Crown Moldings are NON-RETURNABLE, we highly recommend you to buy a sample of this product before placing your order. Pre-cut corners are available for this crown molding, order here.